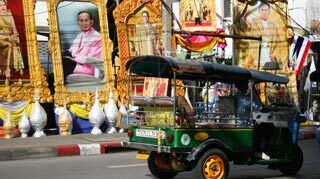 A picturesque, laid-back village sometimes known as "Little Tuscany", lies in a green jungle valley in the shadow of the enormous Doi Chiang Dao - a huge limestone mountain which is the third highest in Thailand. 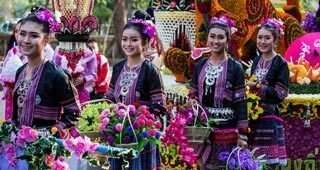 Chiang Dao has a lovely chilled pace of rural life, where you can just laze around in this lovely village to soak in the cool, refreshing atmosphere with its breathtaking scenery, or use it as a base for outdoor activities or visiting hill tribes in the area. It’s a place to just relax and enjoy nature. If you’re not into enjoying outdoor activities there are limited things to do in town and no nightlife. 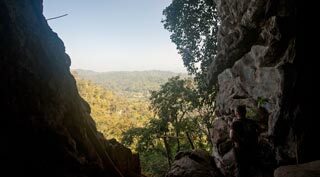 At the base of the mountain, you will see Wat Tham Chiang Dao which is next to the entrance to Tham Chiang Dao - some of Thailand's deepest caves. Or if you're a wildlife enthusiast, you can take a trek into the jungle where the variety of birds and wildflowers is truly endless. 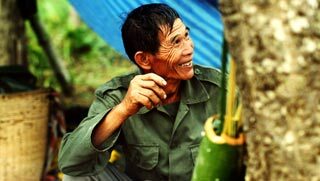 Chiang Dao is also the only area in Thailand where all twelve hill tribes, among them the Akha, Hmong, Karen, Lahu, Lisu and Yao, can be found living in an ordinary, ageless existence in hill tribe villages. 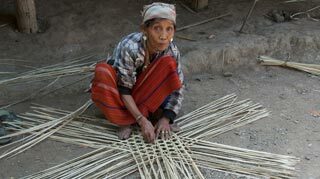 If you have your own transport, you can drive out to four nearby hill tribe villages, namely, Karen, Lisu, Akha Hill and Palong Hill. Ask locally for directions. 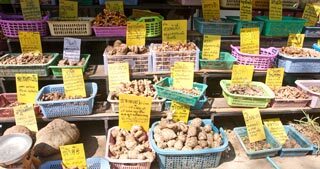 Apart from relaxing and chilling out, things to do in and around Chiang Dao include, caving, which is the most popular activity, along with trekking in Pha Daeng National Park or to the summit of Doi Chiang Dao, or a bit of shopping at the Tuesday Morning Market in the town centre where you can buy colourful hill tribe products. 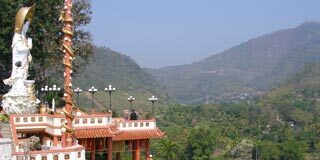 If you are coming here for the caves and trekking best to give yourself at least 2 full days here but it's easy to end up staying more. 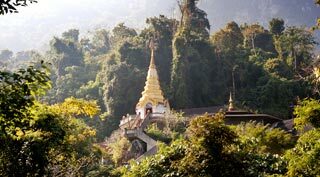 Chiang Dao, which means "City of Stars" is a favourite getaway for the residents of Chiang Mai Town, 80km to the south, with Burma bordering to the north. 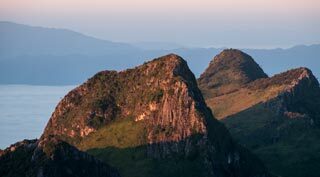 Doi Chiang Dao dominates the town, and if you look up, you can see its lofty 2,175m peak towering above you.